Is there a better time than spring to wear a minty color on your eyes? 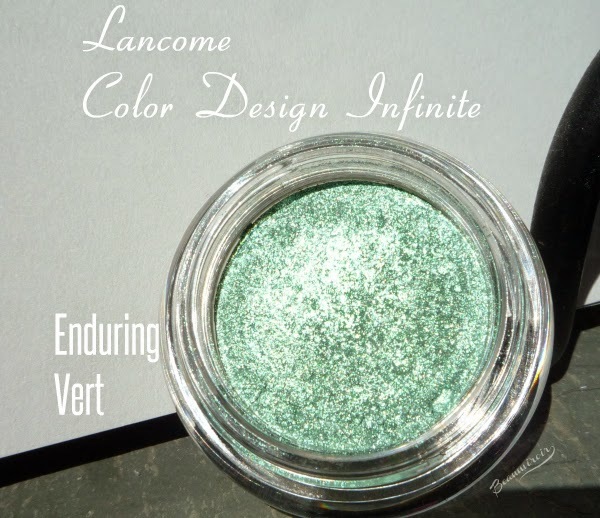 For seasonal looks, I dug out a pastel green eyeshadow that I hadn't been using for a while from my stash, Lancôme Color Design Infinité 24H in Enduring Vert. These little pots of loose eyeshadows have been around for a while and come in a variety of colors (19 shades available on Lancôme's website). Let me make the description as simple as possible: have you ever used a L'Oreal Infaillible eyeshadow? If yes, well, it's basically the same product. If not, this is a loose eyeshadow - but don't let that scare you away, as they're totally mess-free. The packaging includes a little black flat top under the lid that keeps the pigment pressed down in the pot, and it never flies around when I swirl my eyeshadow brush on the surface. The pot is a lot cuter than its L'Oreal counterpart if you ask me, with its rounded shape and Lancôme's rose on the black lid. The brand describes their Color Design Infinite 24H as long wearing, high intensity shadows with buildable coverage. I don't think this is an accurate despcription of Enduring Vert, which is more of a sheer, very shimmery light mint, that cannot be built to full opacity. You can always create the illusion of full coverage by layering it on top of a black base, and that will also intensify the color and the pearl effect. I like it sheer though, as it works really well to create the light, flower inspired makeup looks that I like to wear these days. It is very luminous, so it's a great shade for the inner corner or the brow bone. 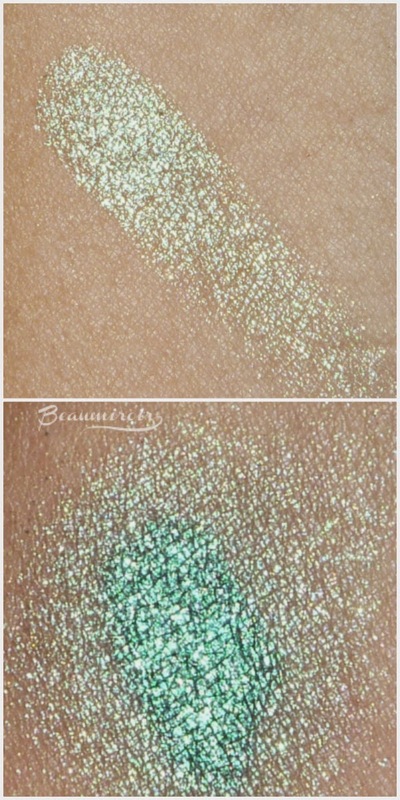 The finely milled powder is really easy to apply and seems to melt on the skin, while creating a little bit of fallout. As usual with shimmery shadows, tapping your brush on the lid will create a softer shimmer, while swiping will intensify the shine and turn Enduring Vert into an almost metallic shade. The wear time is good, I didn't test the 24-hour claim because I doubt it would be a good idea on my allergic eyes, but I have no creasing or fading on top of my usual base (theBalm Put A Lid On It). Overall: a beautiful, sheer shimmery mint to pair with pastels or neutrals for a soft Spring look. Where to buy: at your usual Lancôme counter or online on the brand's website (has 19 shades), Macy's (14 shades available) or Nordstrom (only 8 shades available). SO PRETTY!!! I'll have to look for this one! Yeah it has a light, airy look that I really like! This looks lovely with your green eyes! Have you tried swatching it over a white base? I learned that from a drag queen in NYC. In addition, sometimes the white base trick can help with nail polish if you're trying to work with a lighter color that would normally require 2+ coats to achieve opacity. Ain't nobody got time for that. I don't know why I never think about the white base trick! I think black base but I never think white base, duh. I'll give it a try, but I kind of like it sheer too. Looks lovely on you! Looks full-on night time glam with a black base. Thank you! Yes black base is really the trick to transform a delicate day shade into a party-ready color statement!